The search function built in to WordPress core has come a long way over the past few years. However, if you have a large, complex site you still probably aren’t very satisfied with the results it produces. Fortunately, there are lots of ways to improve it. In this guide, we’ll take a look at how the default WordPress search function works and consider different strategies for improving the performance of this tool. First things first: This post isn’t about search engine optimization or increasing organic search traffic although we’ve written about that topic several times recently. This tutorial is about improving the experience of website visitors who use your site’s search feature to find content on your site. If you need to give your WordPress site search superpowers, this guide will give you several ideas of things you can do to improve the relevance of your site’s search results. How Good is the Core WordPress Search Feature? Up until late 2013, it was pretty common to read articles lamenting the inadequacy of the core search feature. Up until that point, the built-in search function didn’t include any prioritization of search results and only included posts. All search results were returned and sorted chronologically with no further sorting. While that might have worked for a small blog with a few dozen posts, it would never work for a large website with lots of content. Results with a full sentence match in the post title are listed first. Results that include all search terms in the title, but not a full sentence match, are listed next. Results including any search terms in the title, but not all search terms or a full sentence match, are listed next. Finally, search results that include a full sentence match in the post content come last. Within each group, results are further sorted chronologically by publication date. This update meant that search results were now useful for somewhat larger WordPress websites. However, if your website contains thousands of pages and posts, the built-in search function is still far from ideal. Should You Even Bother Improving Site Search? Before you spend any time working on your site’s search feature, you should make sure you’re spending your time fixing a problem worth fixing. We all have a limited amount of time to spend working on our websites, and you should be selective in how you spend that time. If your site doesn’t include loads of content there’s a good chance the built-in WordPress search feature will do just fine. Try out a couple of searches to see how things go. If the results are satisfactory to you, then they’re probably satisfactory to your users. While you’re at it, check your website traffic to determine how frequently visitors use your search feature. I used Google Analytics to check how frequently the search tool is used on a small website I run. What I found is that it only get used about 10 times per month. Obviously, in that case, if I’m going to spend time trying to improve the website, there’s probably a better way to spend it than to spend it tweaking the search feature. However, if your search tool is used hundreds or thousands of times every month, time spent improving site search is probably time well spent. Another thing to think about is your website’s structure. Is there something about your site’s navigation and design that forces your users to use the search feature? If your navigation elements are poorly designed, users may feel compelled to use the search feature for lack of a better way to navigate your site. In that case, fixing your navigation should yield considerably better returns than improving your search feature – although you may want to do both in the long term. So when should you invest the time and energy to improve your site’s search feature? I can think of three scenarios where spending time on improving site search makes all the sense in the world. If you site is exceptionally large, with thousands of posts and pages, a powerful search feature makes all the sense in the world. If your site includes items that are heavily categorized, such as an e-commerce site where each product may fit into a dozen different categories, improving your search feature to make it easier to find content is pretty much mandatory. If your site navigation is well-designed and you still find that hundreds our thousands of visitors use the search feature every month, then you should definitely fine-tune your search feature for performance. Consider adding faceted search features. Switch to a more powerful search algorithm to improve the relevancy of search results served to your website visitors. If your site is a Multisite or BuddyPress network, upgrade to a search tool designed for your site. Provide a better user experience for search users. Not all these strategies will make sense for every WordPress website. Let’s take a look at each, determine when each strategy makes the most sense, and look at some tools you can use to implement each strategy. 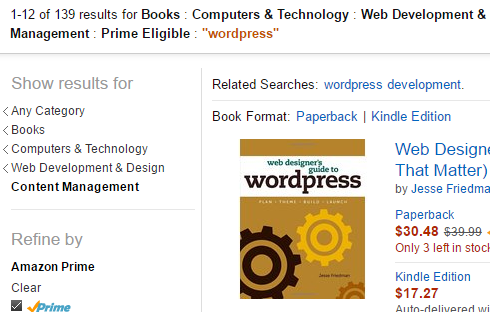 Massive e-commerce sites like Amazon and eBay would be pretty much unusable without faceted search. So what is faceted search? Faceted search, sometimes called faceted navigation, is a way of accessing website data based on a system of categories. The best way to understand faceted search is to head to Amazon. Type WordPress into the search prompt and you’ll be presented with thousands of options. As you have probably done dozens or hundreds of times, you can then use the categories and options in the left-hand sidebar to drill-down to the product you are actually looking for. This is faceted search: the use of categories and options to filter results until you find the content you’re looking for. Faceted search is critically important for sites that have a large catalog of heavily-categorized pieces of content. E-commerce sites are the most obvious example, but any site that includes a large number of similar pieces of content is a candidate for faceted search. Here are some of the best plugins you can use to add faceted search to your WordPress website. Search & Filter is an impressive, feature-rich, free faceted search plugin. With Search & Filter, you use any combination of categories, tags, custom taxonomies, post types, and post dates to filter search results. Facets can be manipulated with checkboxes, radio buttons, jQuery range sliders, data pickers, and more. In addition, you can also either use or disable the keyword search prompt, meaning you can use Search & Filter as a primary navigation element. Results are displayed using AJAX, so your site visitors won’t have to wait for a search page to reload. Interested in Search & Filter? A premium faceted search plugin which we’ve covered in-depth before. FacetWP uses shortcodes to determine the placement of your search control features and results. Custom fields, tags, and categories can be used to create search facets. Results are presented using AJAX for quick presentation of search results. Use this free plugin to create a facet widget which you can add to any widget area on your site. Use categories, tags, custom fields, post formats, and other meta fields as facets to filter search results. Advanced search isn’t a plugin, it’s a PHP framework for developing custom advanced search forms with the option to implement faceted search filtering. If you need a completely custom, powerful, faceted search system, you can use WP Advanced Search to create it. As you can imagine, WP Advanced Search is not for non-technical users. However, WordPress developers shouldn’t have any trouble creating powerful search forms thanks to the detailed documentation that is available. Interested in WP Advanced Search? This relatively new plugin has the potential to turn into something really special. It is powered by the Apache Solr search engine, and if Solr is good enough for Instagram, Netflix, and Ticketmaster, it’s probably good enough for your site. Solr Search for WP enables faceting of search results by tag, category, author, page type, and custom fields. While this plugin is ideally suited to developers in its current state, it has the potential to be a very powerful feature for sites that need fast search, excellent relevancy, and the ability to use search faceting with a large number of search results. Interested in Solr Search for WordPress? Ultimate WP Query Search Filter is a free plugin you can use to create an advanced search form that filters results based on categories, tags, and custom fields. Results can be displayed using either the active theme’s search template or using an AJAX call to render results on the search page. While the search form is not as visually attractive as some of the other options on this list right out of the box, this plugin might be the right choice for websites that need a highly targeted search form which produces narrowly focused results. Sites with lots of similar listings will probably get the most benefit out of faceted search, but sites with a ton of written content may be better served to upgrade to a more powerful search algorithm instead. If Amazon was a great example of faceted search, Google is the ultimate example of what can be accomplished with a powerful algorithm. Think about the differences between results at Amazon and results to a Google search. First, every product at Amazon is highly categorized. Filtering results using facets makes all the sense in the world when the results are all highly categorized. However, results from Google are quite often not as easily categorized. Are you looking for a search mechanism that is closer to what you see at Amazon or Google? If you answered Amazon to the last question, go ahead and head back to the faceted search plugins. However, if you answered Google, read on. 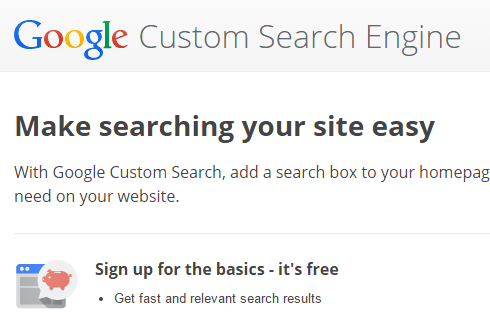 One option that is commonly used to improve WordPress search results is to switch to Google Custom Search Engine (CSE). Getting started with CSE is free and makes use of Google’s core search technology to deliver results culled from your website. The following plugins are all about upgrading the algorithm behind the search tool to produce more relevant results that are ranked more effectively. Some of these plugins use Google Custom Search Engine while other employ different search engines. What they all have in common is that they produce more relevant results than the standard WordPress search feature. You can integrate Google Custom Search with your WordPress website using this plugin from WPMU DEV. Display search results on the search page, in a sidebar, or in a pop-up window. With this flexible plugin you can customize the look of your search page, and set up Google Custom Search to search just your site or multiple sites. Do away with the WordPress search algorith entirely with Relevanssi, and incorporate a search algorithm that matches partial words, accepts certain search operators, and does a better job of sorting results for relevancy. You can even control the weighting of search terms based on where they appear — in titles, tags, or comments. With Relevanssi, you also get automatic search analytics, so you know which terms visitors are searching for. Worth noting: the free version of Relevanssi will not work with Multisite. You’ll have to purchase the premium version to use Relevanssi with Multisite. Interested in Relevanssi - A Better Search? Install and activate Better Search and it will automatically replace the default WordPress search feature anywhere it appears on your site. Better Search is designed to provide results that are more directly relevant to your website visitors’ search intentions. Both titles and content are considered when ranking search results, or you can turn off relevancy ranking entirely and the results will be sorted by date. Allow your users to search posts, pages, and custom post types with this free plugin. Two unique features of this plugin include an automatically generated popular search term heat map which you can easily display anywhere on your site and a customizable list of words which will be automatically filtered out of search queries (profanity, for example). Swiftype Search includes three powerful search enhancements. First, an improved search engine replaces the standard WordPress search function and returns results with improved relevancy. Second, results for specific terms can be customized. This means that you can specify the results that should appear when specific terms are queried. Third, detailed analytics are provided so you know which terms users are searching for. However, a Switftype account is required to access some features of this plugin. This relatively new plugin replaces the default WordPress search function with a powerful search engine which returns more accurate results ranked for relevancy. In addition, you can use this plugin to search additional types of content and the search algorithm has the ability to match fuzzy and incomplete phrases. Other features include autocomplete suggestions, search analytics, fully-responsive search results, the ability to change the default weighting of terms based on where they’re found, and the ability to move search processing off of your web server to the SearchIQ server. Interested in Better Search by SearchIQ? Google Custom Search is a simple plugin that allows you to easily integrate Google Custom Search Engine with your WordPress site. It’s a bit light on options, but if you just want the absolute basics, this plugin is a good option. Google CSE gives you Google Custom Search Engine results displayed in your themes search template. This way, the results are more powerful but still match the styling of the rest of your site. Development of this plugin is managed at GitHub, head there to learn more. Not all search plugins work well with Multisite or BuddyPress sites. While several of those we’ve listed can be used by sites that are part of a Multisite network, none of them are designed to make it easy to search all of the content of a Multisite or BuddyPress network. If you run a Multisite or BuddyPress network, here are a couple of search plugins designed with your network in mind. Search every post across an entire WordPress Multisite or BuddyPress network. This WPMU DEV plugin, works hand-in-hand with Post Indexer to search a customizable and comprehensive list of WordPress posts from across your entire network. Make it easy for member of your network to find content created by their peers within the same network with this powerful plugin. Interested in Global Site Search? Create a sitewide BuddyPress search feature which members can use to search through all community pages, posts, custom post types, forums, and more. Search results are displayed using AJAX in a drop down box that appears while users type in search terms. This BuddyPress-specific search tool includes BuddyPress-specific search options, such as searching Activity and Member profiles, making it a better option for any BuddyPress site. Interested in BuddyPress Global Search? If your site doesn’t include thousands upon thousands of posts but you still want to improve the experience of users who use site search, there are many plugins that enhance the power of the built-in WordPress search feature without replacing the core search function. For example, let’s say you want to add AJAX-powered search results that display on your search page. Well, you can roll your own, but if you want something quicker and little less challenging, there are lots of plugins that bring AJAX-powered results to WordPress search. Another popular enhancement often added to the standard WordPress search function is the ability to search additional types of content, such as custom post types and media files, or the ability to filter results based on taxonomy. Under what circumstances should you consider one of these plugins rather than faceted search or an upgraded search engine algorithm? Use of these plugins makes all the sense in the world if the standard WordPress algorithm produces reasonably useful results on your site. Or maybe you’re saying to yourself: “To heck with it, I don’t care if only one person uses my site’s search every month. I still want to make it better.” In that case, this next round of plugins is definitely for you. One of the most common criticisms of the built-in WordPress search feature is that it doesn’t search everything. This plugin fixes that. Search Everthing does exactly what it’s name says: it searches everything. In addition, this plugin includes a writing helper, called Research Everything, that makes it easy to build internal links by searching your site for related content while you write. Additional options built-in to this plugin include the ability to exclude specific posts, pages, and password-protected content from the search results. One of the most popular plugins in the WordPress plugin directory for adding AJAX-powered autocomplete results in a drop-down box directly below or above the search prompt. This straightforward plugin makes use of the standard WordPress search function to find results, and then displays those results in real-time as users type in search terms in a customizable drop down box. Customize how those search results are displayed and choose whether or not to display a View More Results link at the bottom of the pop-up window so users can click through to the full results. Interested in Dave's WordPress Live Search? Add simple, cleanly formatted, AJAX-generated, autocomplete suggestions to your search tool. You can easily customize the appearance of the autocomplete drop-down by using jQuery UI ThemeRoller or select from one of the included predefined color schemes. Additional options include the ability to include custom posts types and taxonomies in search results. Make search beautiful with this free AJAX-powered plugin. Website visitors will have the ability to search posts, pages, and custom post types, as well limit results to specific categories. The real power of this plugin is on display as results are displayed in a drop-down box as search terms are typed, giving website visitors a preview of the results they’ll see if they complete the search using the current terms. Interested in AJAX Search Lite? Filter search results by adding categories and tags directly to the search prompt in addition to plain text search terms. Categories and tags are automatically suggested by the autocomplete feature built into this plugin. Results are fetched and displayed with AJAX for a smooth and speedy search experience. Interested in WP Ultimate Search? Display query results in a drop-down box filled with AJAX-generated search results. Users can select from the suggested results or click-through to a complete results page. Search results are grouped into posts and pages, allowing users to pinpoint specific post types when searching for content. Interested in Search in Place? Expand the WordPress search tool to include posts, pages, and custom post types. Limit search results by categories, tags, and custom taxonomies. Do it all simply with a minimal number of settings to configure, and drop a WPCS search prompt anywhere on your site by pasting in a shortcode. Interested in WPCS (WordPress Custom Search)? Better WP Search offers two simple enhancements: if only one result is found users are redirected to that search result, and the search URL is changed from /?s=query to /search/query. Instant Search & Suggest expands search results to include pages, categories, and tags. In addition, this plugin adds AJAX-generated autocomplete suggestions as soon as a visitor begins typing into the search prompt. WP Extended Search takes the default WordPress search function and gives you the option to expand the results to include categories, tags, pages, and media files. In addition, you can limit searches to just titles, just content, or search both titles and content simultaneously. Obviously, you’ve got a lot to think about. Search is an important tool on many WordPress websites, and there are many ways to improve the search function built-in to the WordPress core. Our suggestion is to clone a copy of your site to a local development environment and to try out a few different options. By doing this, you can identify the option that is the best fit for your site and fine tune it before implementing a new search function on your live website. Do you use any plugins or tools to provide a better search experience on your site? Which tools or plugins have you used and what was your experience working with them? Let us know in the comments. Glad you enjoyed the article! What kinda Multisite network are you running? Thanks for this great article, actually I was looking out for the ways make my site search clean and easy for the visitors.. the autocomplete feature I think will be most helpful here..
Not sure what’s happening with the visual editor in WordPress, but it repeats sentences from time-to-time. Very weird! You might be right! I looked at it several times. It does look like a very good option — if a bit challenging to set up. Thanks Raelene for this extremely comprehensive and in depth review of the search plugin scene. It’s this kind of research that is worth the WPMU subscription alone. I’ve tried a lot of these plugins in development on my single site WordPress instance and managed to create a facetted search which includes the ability for users to limit/filter their search to a subset of ‘microsites’ and what I am calling ‘post types’ which means things like “How to posts’, ‘Review/Comparison Posts’, ‘Opinion Pieces’ etc. It ‘think’ the time has come for me to upgrade to multisite, not because I want the WordPress.com type functionality of users being able to create their own microblogs (yet), but because I want my site to have sub-sites mapped to different domains with some data universal and some site-specific data and theme mapping. There are pros and cons with either path which I won’t bore you with now. The point I’m getting round to is one of the factors in determining whether I move to multisite is whether I can implement a multisite wide faceted search. The nearest component you list seems to be the BuddyPress Global Search… now I’ve never really got into Buddypress…I’m not even sure if it’s an alternative to, or an additional layer on top of WordPress Network. You say it’s ‘BuddyPress-specific’ so I would have to install Buddypress which could just add another layer of unnecessary complexity or provide a bundle of really useful community type features (but that’s a whole other topic). The other thing you mention is: “While several of those we’ve listed can be used by sites that are part of a Multisite network, none of them are designed to make it easy to search all of the content of a Multisite or BuddyPress network.” Could you expand on this a bit? Do you have any additional intel on whether any of the faceted search engines are more or less ‘easy’ to integrate with a WordPress Network? Many thanks again. Sorry I meant to address this to Jon! You can exclude certain subsites from being indexed, index a particular site right away, index pages as well as posts, index posts manually, choose a timeframe for when posts are indexed and choose posts types to be indexed per site. It sounds like that might meet your indexing needs and then Global Site Search will search through what Post Indexer has indexed. *groann* I’m new to WordPress and it seems like every single facet of my site requires a PhD (or at least another three weeks to truly grasp and understand all the options for perfecting it. AND I LOVE IT! (sort of). All joking aside – I just want the ability to decide which Post *OR PAGE* appears in which order for certain search phrases. So if someone types “Propecia” I want to define exactly which page they see at the top of the search results. Currently I notice that WP puts “Posts” first, and my site is structured such that *Pages* are my most important core, static content. Posts are just my news section. So I don’t know if I need all these incredibly elaborate solutions. I just want to say “Hey – stop putting that Page at the bottom of the results list, lets put it at the top”. You want to preset the search results for certain search terms. You want search results that treats posts/pages equally or even allows you to favor pages over posts. You want pages / posts to look the same in the search results. There are quite a few options that will take care of problem 2. Search Everything from the article above the most obvious solution, but it won’t fix problem 1 for you. Problem 3 can be fixed with CSS. Once you fix problem 2 (and problem 1 if possible) you can use CSS to overrule the styles built into your theme with custom styling that makes pages / posts show up looking the same in the results.